Answer: Boy, am I the wrong fly fisher to answer this question! Why did you pick me, J.R.? Oh, right… you didn’t. Well, anyway, here we are, and, actually, I’ve snagged nymphs on streambeds probably thousands of times over several decades. Maybe I’m not such a bad choice. The reason I felt you might get a better, or at least a more balanced reply from someone else is that I have a minor character flaw: I hate to lose flies. I hate losing rigs like the ones you mentioned, too. It’s not that I don’t enjoy tying new flies to replace lost ones. Maybe it’s a hoarding thing. Anyway, I’ll typically, and readily (though slightly ashamedly) mess up a fishing spot if doing so will give me a good shot at saving my nymph. When you, J.R. (or anyone else) hang up on the bottom, you often wind up having to answer this question: Which is more important to you, 1. continuing to fish that bank or current seam—or—2. saving your fly? We all want both, of course. But we seldom get both. Still, there’s hope. It’s wise to start with the quiet moves: a few long, firm pulls in case the nymph is caught on a small waterlogged branch that’ll come loose and drift off through the water naturally enough that the fish won’t care. After creeping low upstream, some tugging from that direction, pulling the fly, with luck, back out opposite the way it went in. Dropping the rod-tip to let everything go slack so the nymph might just drop off the edge of some rock. Pulling slowly from several directions. You can try these tactics in any order that seems the most promising. Sometimes they work. 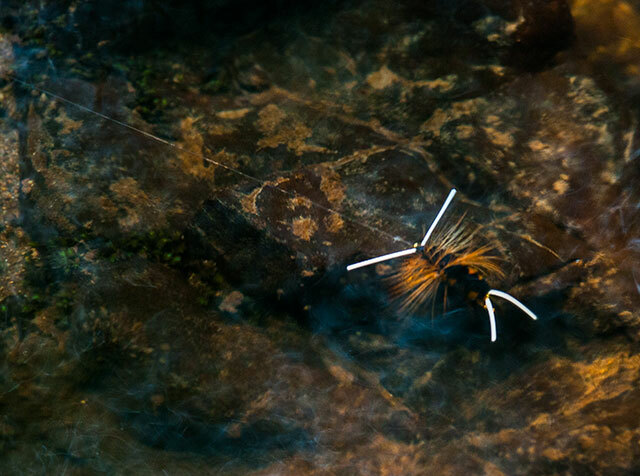 If I have a fishing companion nearby, and my stuck nymph is outside of the best water, I’ll invite him or her to fish while I hold my line out of their way—then at least somebody gets to work the spot through before I plunge in to save my fly. Once I do go in, I use my tricks to, usually, retrieve my beloved nymph. If I can wade clear out to the fly, and the streambed is rocky, I’ll try to follow my leader and tippet down to see where the fly is stuck, then push or kick the stones there with a foot. Or just reach down and work it free by wet, cold hand. One way or the other often does it. I hesitate to even mention this one, but I sense, J.R., that you’re the patient, responsible sort who’ll take my warnings to heart. So, if you dare, you can work the tip-guide of your fly rod slowly down leader and tippet to the stuck nymph. Then—with gentleness so intense that it approaches fear—give the fly a tiny push in hopes the hook will back out of trouble and come free. I broke a rod-tip doing this once; that impressed me. But I still do it now and then. It’s just a nudge on the nymph—a light nudge. That’s all. Any sort of real force will start to double that flexible, fragile tip and snap it in two. A nudge can be enough, though, sometimes. If after all this your nymph is still stuck, then, as you said, J.R., it’s time to pull and pray. Check the ferrules and push them securely together if needed (a section that comes loose after tippet breaks may just slide off to the Great Unknown, since there’s no fly to stop it), point the rod at the fly, clamp onto the line, and simply pull until something gives. Rearing back on a deeply bent rod against a stuck fly can result in a broken rod (with the fly probably still stuck). Do point the rod at the fly. On the bright side, after tugging around a tight fly line under water, even after wading out and kicking around river rocks down there, you can leave the water alone for 15 to 20 minutes, an hour at most, and after that the trout will probably be back on track, feeding and ready to grab your nymph. I once watched a herd of elk slosh across a fine-looking riffle. It occurred to me that events like that must occur all the time on trout streams. If trout went off the feed for half a day after each such event, they’d starve. Trout turn suspicious, even panic, and yet go get back to feeding fairly soon. It all just goes with being a trout. None of this provides the answer I’m certain you wanted, J. R.: a reliable formula for saving snagged rigs while leaving the trout around them undisturbed. I’ve been nymph fishing rivers for decades and haven’t yet found that formula. Nor do I know anyone who has—and I know some killer fly fishers. But maybe just knowing you and I and the rest of us share the same frustration helps. I hope my ideas help, too.